David Barnes paintings are highly textural. He uses a palette knife, painting in oils and using a thick impasto technique to produce bold strokes that add strength and texture to his paintings, giving it a sculptured feel. 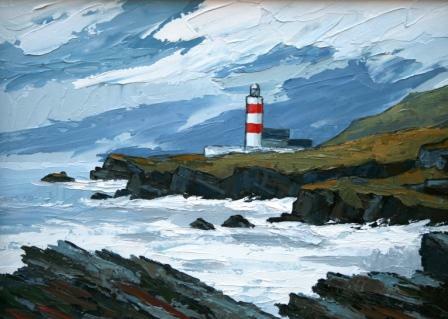 This painting style adds to the contrast between colour, light and shade in David Barnes'' work and the power of the natural elements on Bardsey. Bardsey Island, Ynys Enlli in Welsh, lies off the north coast of Wales, near the Lleyn peninsula. It is known as ''The Island of 20,000 saints'', there is a celtic cross there to commemorate the saints believed to have been buried there. Bardsey lighthouse stands at the southerly tip of the island and guides vessels passing through the dangerous currents of St George''s Channel and the Irish Sea.